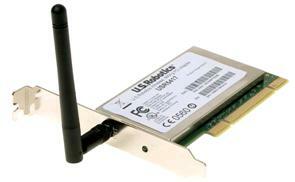 The USRobotics USR5417 Wireless MAXg PCI Adapter provides high performance and secure wireless connectivity for desktop computers. Featuring exclusive MAXg™ Technology, the PCI adapter provides 50% greater range than standard 802.11g — to maintain solid connections throughout your home or small business while providing a MAXimum performance of 125 Mbps. Furthermore, it’s also backward compatible with other 802.11b wireless products. Wanna to try? You can get it here! Easy to install. Works but, still too far from router to keep consistent. Would buy again. As soon as I installed the device and gave it the proper password, it worked great from the outset, and is still operating without a problem on my home network. This is an okay PCI adapter, but I actually like the previous model--U.S. Robotics USR5416 802.11g Wireless Turbo PCI Adapter--better. The interface on the Turbo version was a little simpler to deal with. I upgraded to a MaxG PCI adapter to match my MaxG router, but did not notice any improvement in the performance. I found the unit gave low reception levels and had to use its software to operate. Was not compatible with windows software. I have a cheaper belkin that gives better sensitivity. Return to top of "USRobotics USR5417 Wireless MAXg PCI Adapter"! !